I thought I would do a little post about today, as it has really been such a nice one. Waking up this morning, it was overcast and drizzly - perfect tea / toast weather / relaxed email responding weather. So, I hopped to it straight away, and launched into some editorial follow ups. Right now I am working on a fashion spread for Smith Journal, so I sat with the poochies and set about following everything up. Yesterday morning my puppy Daisy gave us all a bit of a scare by having a small seizure as she woke up (don't worry, she's fine and a trip to the vet has been sorted), so I have been keeping her and Daphne extra close to me to ensure they are within patting distance at any moment. Right now, in fact, they are sleeping on my desk. After writing some emails, I hit the pom poms again for a couple of hours. 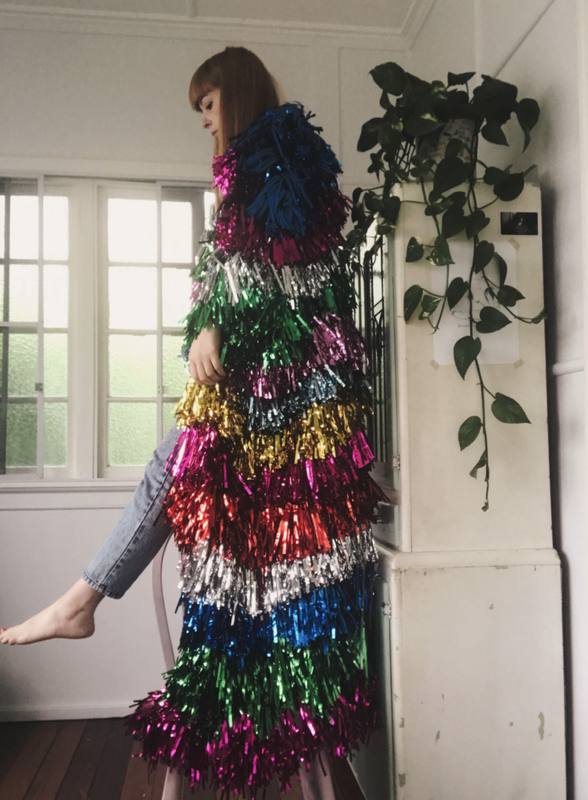 For anyone who follows my instagram or reads this blog, you might have seen that I have a couple of pom-pom-oriented exhibitions in the works - one for Apomogy and another massive-o installation due at the end of the year. 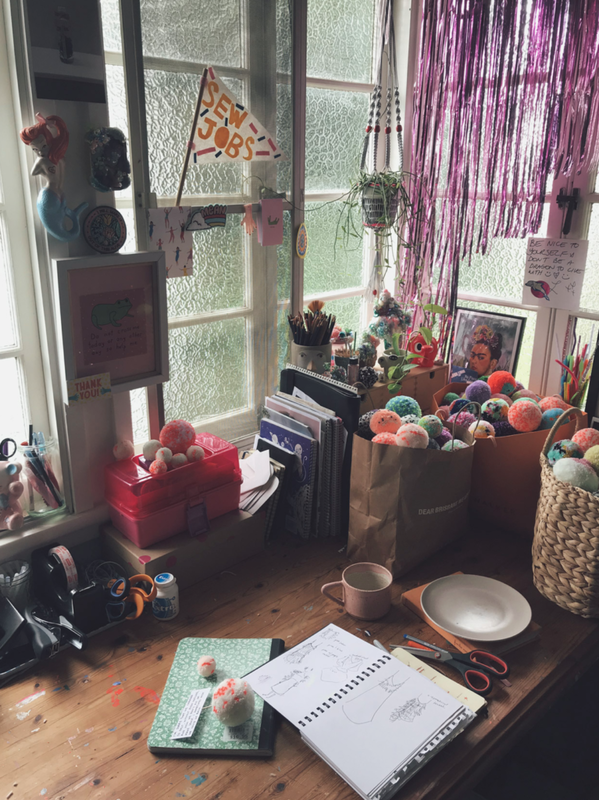 As such, I have been trying to set aside some time each day to make some pom poms so that I don't fall behind and suddenly find myself VERY panicked. I have peen particularly obsessed with some neon orange wool - I just love how it looks with white and peach wool...especially on these little mini pom poms too! Gah, obsessed! So after a bit of pomming, I also applied the finishing touches to some jacket orders - one of which I am crazy excited about. 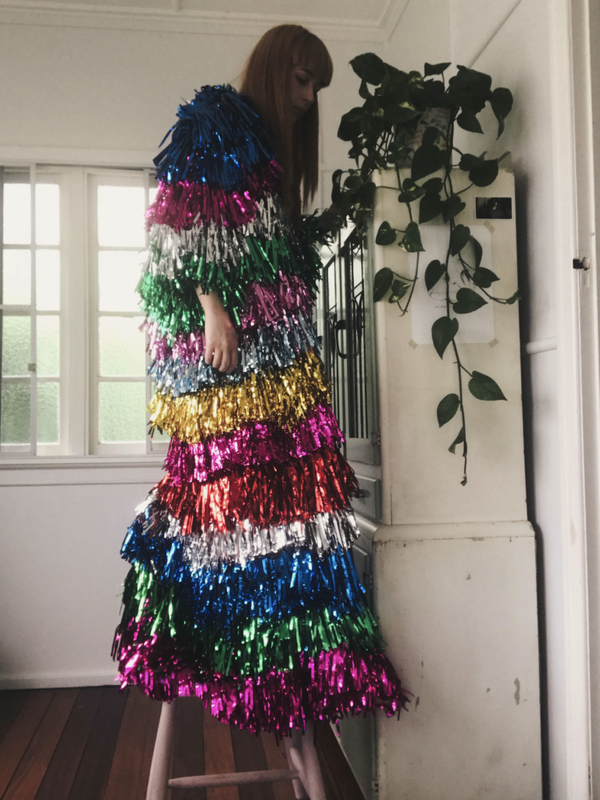 It's this massive rainbow coat destined for Ashley Longshore (this fabulous American Artist). I can't imagine anyone better suited to wearing such a fabulous coat! As is tradition, I had to give it a little try on before I posted it off. When I got home and opened the post I was pretty stoked to find the latest issue of Frankie! Not only was I excited because...FRESH FRANKIE....but I also photographed and styled the fashion editorial in it! So keep your eyes peeled for that one! Anywho, that was the day in visual form. Now, I will cook some dinner with Thomas, take the puppers for a walk, and then probably make a jacket order whilst watching the new Netflix version of Dynasty (which I am obsessed with). As a side note, now that I have a bit more time on my hands, I can see this blog becoming more of a running diary for me over the coming months. I don't know if people even read blogs very much anymore...but I still enjoy them haha...so I guess I'm saying, expect more where this came from.